The Internal Revenue Service has announced cost of living adjustments affecting dollar limitations for pension plans and other retirement-related items for tax year 2016. The catch-up contribution limit for employees age 50 and over who participate in 401(k), 403(b), most 457 plans, and the federal government’s Thrift Savings Plan remains unchanged at $6,000. 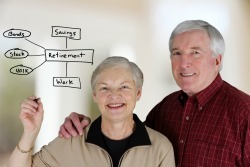 Contribution limits for SIMPLE retirement accounts remains unchanged at $12,500. Questions? Help from your accountant is just a phone call away.